The exciting New Inductive Study Series (more than 880,000 copies sold) was created by Kay Arthur for people who long to immerse themselves in Gods Word but need a 15minutesaday resource to match their busy lifestyles. This exciting study focuses on Zecharaiah, Malachi, and Haggai, three prophets who shared Gods messages of instruction and discipline and also words of encouragement and hope. Exploring these books of the Bible provides an insightful study of Gods communication, character, and blessings. Using Kay Arthurs inductive study method, the truths of these Old Testament books inspire readers to hear Gods message, become obedient, and share in the living hope of a Father who clearly conveys the promise of great blessings. 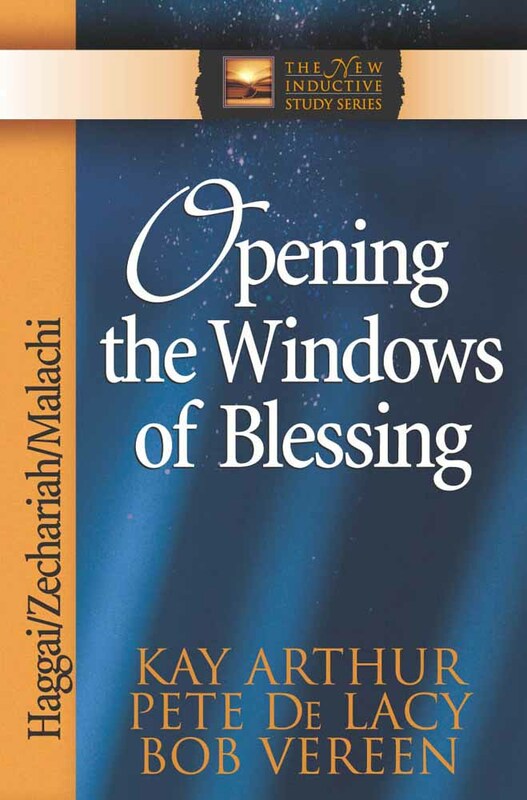 Opening the Windows of Blessing: Zecharaiah, Malachi, and Haggai by Kay Arthur;Pete De Lacy;Bob Vereen was published by Harvest House in January 2003 and is our 33869th best seller. The ISBN for Opening the Windows of Blessing: Zecharaiah, Malachi, and Haggai is 9780736901499. Be the first to review Opening the Windows of Blessing: Zecharaiah, Malachi, and Haggai! Got a question? No problem! Just click here to ask us about Opening the Windows of Blessing: Zecharaiah, Malachi, and Haggai.